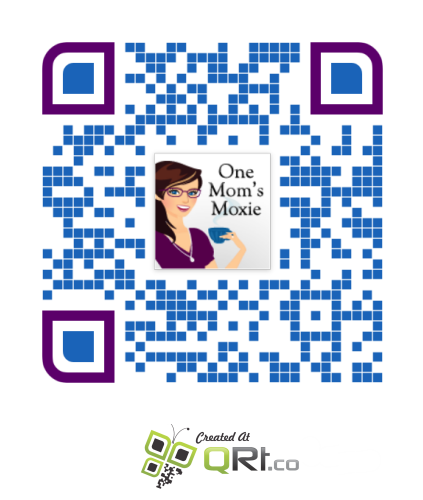 One Mom's Moxie: My New Custom QR Code!!! As a blogger I like to try to keep up with all the cool new trends. So when I found out that you can have QR codes custom made I started searching trying to find where I could get one made for One Mom's Moxie. So when I received an email with the opportunity to have a QR code custom made! Of course I jumped at the chance and crossed my fingers that I would be accepted to make one. I was able to use a custom QR code editor to make my very own code. I absolutely LOVE my custom made code. The website QRt.co has so many different ways to custom make one and for those that prefer a pre-made template they have those as well. There are so many different shapes for backgrounds, as well as for the corner pieces. I also was able to pick the colors. I could go on and on about the variety of ways to make your own QR code. You don't have to own your own website to make one either, they can be made for your Facebook, Twitter or any other social media that carries personal pages. The reasons and varieties of QR codes is endless. I highly suggest QRt.co for any and all of your QR code needs! *Disclosure: Please note that I only received product in order to conduct a review. No other monetary compensation was provided. All opinions in this post are 100% my own.